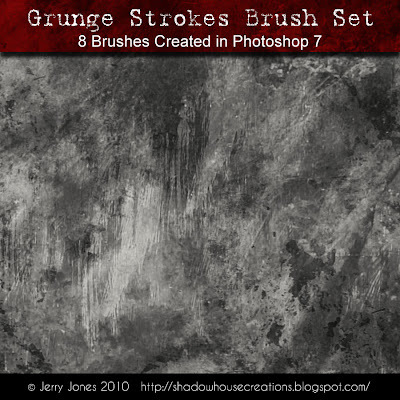 Photoshop grunge stroke brushes, 8 brushes,image pack included. and newer, also PS Elements 3 and up. It seems as if the link isn't working. Or is it my computer? Thanks Barbara, I was changing my background earlier and it must have affected the link, but it's fixed and ready to download. Thank you, these are great. Looking forward to trying them this weekend. Thank you, Jerry. Another new look - love it! Thanks for the brushes Jerry. I look forward to using them soon. Hi Jerry! I'm unable to download brushes (I have psp) but can download your other freebies. Thank you for your generosity! I LOVE your other grunge brushes and can't wait to try these. Here is a link that shows some antique papers I made with the others. http://vivayne.com/2010/07/03/sneaky-peak/ Thanks for the DL! Thank you, Jerry; I really enjoy using grungy brushes. These look scrumptious! Thank you!